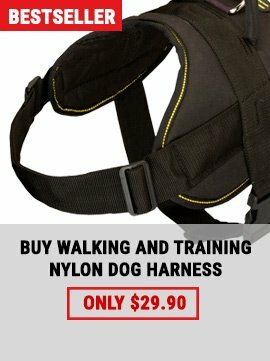 Would you like to own the most reliable dog accessory? What about collar made of softest leather? You, of course, do want your pet to feel extremely comfortable when wearing his ammunition. It is very kind of you to continue searching right equipment for his training/walking. Where from do we know that it is not the initial search of yours? It is easy to understand that you are probably disappointed with useless articles available on the market. 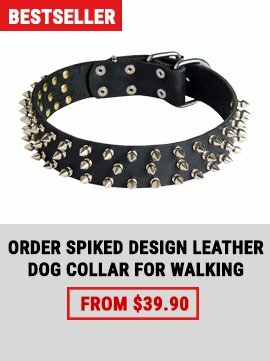 Do you need a nice walking collar that looks great by this? 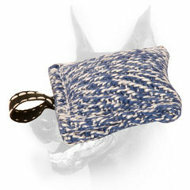 Your dog’s attractive appearance and unbelievable comfort are granted with one and the same canine equipment. 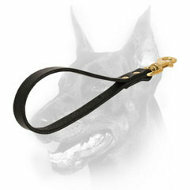 Leathern collar from most recognized manufacturers is introduced on this page. 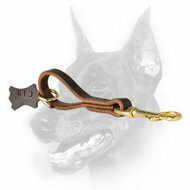 Combing best features this small but indispensable item for big four-footed friends will do you a good turn in case you get it for your Doberman. Your Doberman boy or girl will really enjoy wearing this comfortable neck dress. 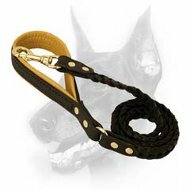 You love your Doberman very much; our makers love this living being too if they managed to create such an excellent product for this breed. As you already know, the market will never offer you highest quality products because mostly second hand goods can be found there. We, on the contrary, make it possible for you to use a truly dependable yet multitasking training or walking facility, if you like. 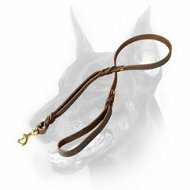 Elegant leather dog collar for Doberman will look on your pet very well! 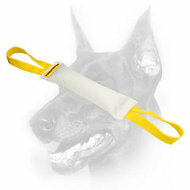 It is perfect tool for handling large dog breeds like Dobermans who are strong and agile. Dobermans are trainable if their trainers have special tutorial knowledge and do not neglect applying relevant gear. Are you an ambitious dog handler? 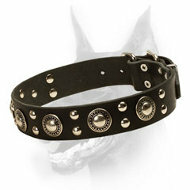 Then wearing your pet in this collar you will be completely satisfied with his look. 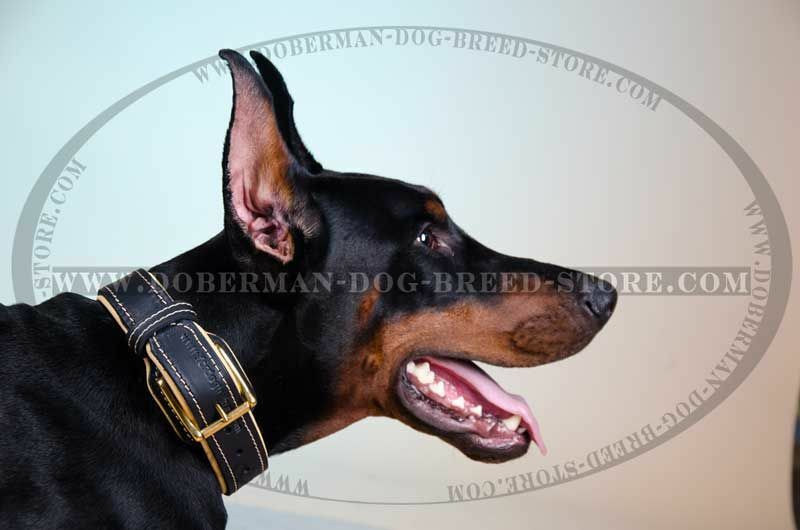 Your Doberman will be beside himself with happiness at that – his beloved owner is near and nothing discomforts him at all – no pain, rubbing, itching, irritation and similar is possible because of the wear. Getting products from us you run no risks – we do not want to damage your pet’s health but want him to be a success in his canine life. High quality product which components are free from poisonous, allergenic substances. Only high grade materials are used during manufacture of our dog production. We select them by hand, choosing out of the best ones. 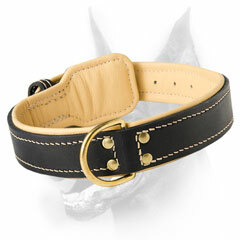 Full grain leather is perfect natural material that is ideal for dog collar. It is strong but soft, it is practical, safe and good-looking in addition. Comfortable leather collar that should be worn daily – walking or training your Doberman will not even realize that he is wearing it. Besides, the collar is padded with softest Nappa that delivers best unbelievable comfort to the wearer. Nappa padding has attractive beige color that goes well together with dark color of full grain leather. 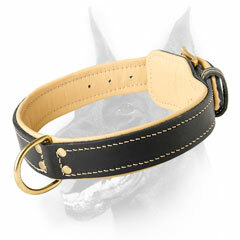 Well-made collar with well-thought design and rustproof finish. 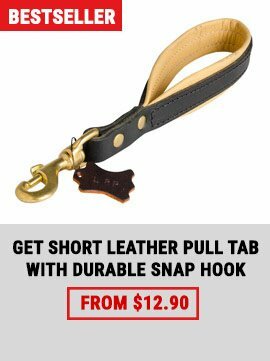 Manually created leather invention for best canines worldwide deserves to be your pet’s belonging. First of all, buckle and d-ring are very solid, secondly, they're resistant to rust, thirdly, buckle protector will prevent hair loss. The collar does not discolor dog hair – everything is perfect in this unique merchandise. Pay attention to disposition of the Ring – it is in the rear – so your efforts focused on fastening of a leash will not be painful – it is much easier to attach a leash when dee ring is at the back of the neck.